This is going to blow you away. What do you normally do when you save a file or want to open a file in a specific folder on your hard drive ? You click your way through the folder structure of your operating system until you finally reach the desired folder. 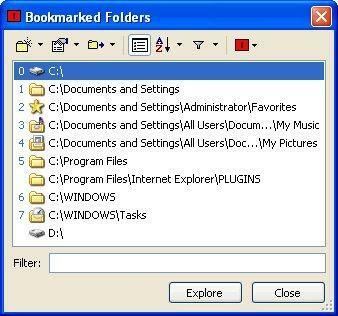 This is a thing of the past because we can use bookmarked folders to reach those folders instantly. Want to save a file ? Press a hotkey in the Save File window and it displays that folder instantly. Want to access a folder in Windows Explorer ? Press another hotkey and Windows Explorer opens displaying the contents of that folder. All of that functionality in an 146 Kilobyte application, wonderful. Setting up Dirkey could not be easier. You either bookmark them when a Open / Save window is active or by adding the full path of the folder to the software directly. You can test it out by opening the Run box and clicking on Browse for instance. Once you mark a folder you press the keys CTRL + ALT and a number between 0 and 9. This assigns that number to the folder. Whenever you need it in an Open / Save file window you press CTRL + the number that you have selected and it will immediately switch to that folder. The same hotkey works in any active Windows Explorer window. If none is active you can still press CTRL + Windows and the number to open a Windows Explorer window displaying the folder of that bookmark. Three plugins can be downloaded from the Dirkey website that add the bookmarking functionality to Winzip, Microsoft Office and xplorer2. A SDK is provided as well which can be used by programmers to add the functionality to unsupported applications. Update: Windows Explorer in newer versions of Windows ships with options to add any folder to the favorites listing in the sidebar. Note that the Dirkey website is no longer available and that it can still be downloaded from Cnet and other software repositories.